Northern Law Blog: Can Macy's be forced to honor this advertisement? Can Macy's be forced to honor this advertisement? 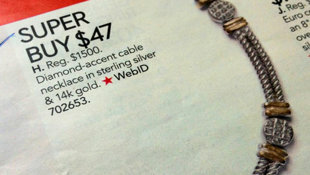 Macy's mailed an advertisement this month that listed a $1,500 sterling silver necklace for $47. The list price was supposed to be $479, but the advertisement contained a typo that listed the necklace for $47. Apparently, several customers did get this "super buy" because when Robert Bernard arrived at a Macy's location in Plano, Texas, he was told that they were sold out of the necklace. The teller did offer to have the necklace shipped to Mr. Bernard's house though. He paid for the necklace at the register and was told that it would be shipped shortly. Before the necklace arrived, however, Mr. Bernard received a voice mail from Macy's telling him that the advertisement had been a mistake and that his order had been cancelled. Let's analyze this situation from the perspective of a breach of contract case (in Illinois). In order to form a contract, there must be an offer and an acceptance. Ordinarily, a newspaper advertisement, whether it contains an erroneous purchase price or not, is not an offer that can be accepted to form a contract. The advertisement is construed by the courts of Illinois as an invitation to the general public to come in and make an offer. It would then be up to the store to accept the offer. At that point, you'd have a contract. See, for instance, O'Keefe v. Lee Calan Imports, Inc., 128 Ill.App.2d 410 (1st Dist. 1970). So, not everyone who received this advertising circular from Macy's can sue them for a $47 necklace. Mr. Bernard, however, might actually have a case. Mr. Bernard did make an offer in response to the advertisement. Macy's, through its agent (the store clerk), accepted his offer. He fully performed by paying $47 on his credit card. He is entitled to full performance of the contract by Macy's. In my opinion, Macy's breached the contract by calling and telling him that his "order had been cancelled." I'm sure some of the brilliant Blog followers will be able to argue the other side of this case. Who wants to defend Macy's? Who wants to tell me why this was not a valid contract? Who wants to make Professors Gaebler and Reynolds proud???????? Any and all comments would be appreciated.